Designed by renowned architect Mrs. Archana Sachdeva of Delhi, Solluna Resort holds out the promise of a stay which is sure to remain etched in your memories forever. The facilities it has on offer coupled with flawless personalized services rendered by its staff makes it a favorite amongst all those who've come here to answer the call of the wild. It is unarguably one of the finest examples of jungle accommodation in India. The cottages are a tempting mix of ease and elegance. Sink into the snug beds and all your fatigue is sure to vanish in no time. The star studded sky from the skylights in the rooms is a visual delight. Sit in the rear verandahs and savor precious moments with nature. The multi cuisine restaurant "Top Pavilion" has a unique decor. It is characterized by rough walls and wooden tables. However this rustic ambience along with its lavish and sumptuous buffet spreads is what makes it quite distinctly different from any other eatery. All your taste buds are sure to be pleased after a meal. The 24 hours coffee shop is also a great place to drop in for a cup of piping hot coffee and mouth watering snacks. The conference hall of the resort is well equipped with needful business amenities and is ideally suited to meet the needs of corporate travelers. Set up way back in the year 1936, the Corbett National Park is the oldest National Park in the country and one of the most frequented wildlife sanctuaries. It is in fact one of the foremost tourist attractions in Uttrakhand. 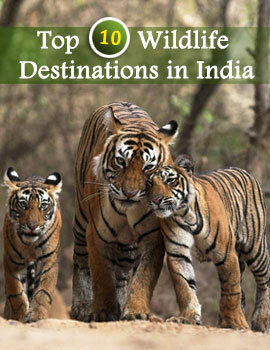 Wild life lovers visit it to witness the interesting variety of flora and fauna housed within it. The greatest draws are the tigers and the leopards.